This is the story of how I bought 5 ingredients from Trader Joe’s and made one of my favorite dinners of all time. The story begins with Lunch Envy as I watched my friend and coworker eat her saucy baby pasta with all those tiny chopped veggies in that creamy tomato base in the beloved teacher’s lounge. The place where great lunch ideas are born, right? I asked for the recipe before she had even taken one bite. Like the recipe-hungry food-bloggin’ girl that I am. To develop the story for you, things have been pretty crazy for us lately. Oh yeah, that’s right, welcome to all of the lives of all the people in the world. WHY, you guys? Why do we do this to ourselves? With the closing on our new old house which I have affectionately come to call our Yum Sweet Home (and which will be pictured in the next few days), and the out of town weekends for things like Holiday Baking Classes (rough. I know. ), and the back-to-work Mondays with early morning meetings, and the late night cookie baking to keep caught up on the blog to keep sane, and the preparing for showings on our current home which = cleaning which = wahhh, I just don’t even know. ALL OF THE THINGS. Time starts to feel slippery. And then, I know you probably can’t relate because you are beautiful home cooks who find time to make your families wholesome home cooked meals always no matter what, but we here in this home often find ourselves making up for lost time by eating things like toast and cereal and frozen Amy’s organic meals. Which I could eat forever but it would still probably be good to cook once in a while. Simple dinner that has rockin flavor: come to me. Pasta e Fagioli just means pasta with beans, at least as I understand it after two seconds of Wiki reading. I added chicken sausage because, well, meat. So I claim no authenticity here, just a recipe that tastes great and takes very little time. Trader Joe’s was the perfect place to stop on my way home from work because I could pick up some high quality short cut ingredients like the aforementioned CHICKEN SAUSAGE and a newbie to my ingredient favorites: MIREPOIX. The chicken sausage that I bought was spicy Italian, made with red wine and Formaggio cheese. Um, what? How delicious is that?! (Very.) I just about burned my nose off cooking it – you know, when you cook spicy stuff and you end up basically choking? but then I settled down and ate a lot of it. Fast. It was so very yummms. And then the mirepoix? Just a fancy word for chopped celery and carrots and onions that will be used as the veggie base here. TJ’s hooked me up by chopping the veggies for me and packaging them in a little container and placing them in the produce section for my time-hungry eyes to see. By the way, this is in no way sponsored by Trader Joe’s. I am just over the moon excited that there’s one open within 20 miles of my house and was so happy with how their ingredients worked in this recipe. Superfan. When this all cooks up, it’s going to look like a lot of sauce at first. Really good sauce, made with San Marzano (aka best tasting high quality) tomatoes and a plethora of other veggies. Including my friend baby spinach who had been occupying a lonely shelf on the fridge and needed a good home. But just when you’re questioning whether you actually need this much sauce or not, you add the pasta – as it turns out, orecchiette from Trader Joe’s will be a good choice – and the sauce just soaks right into the pasta and you’re left with this velvety texture that is both saucy and thick. It’s not like soup, it’s like saucy pasta. Loaded with veggies. And red wine Formaggio chicken sausage. 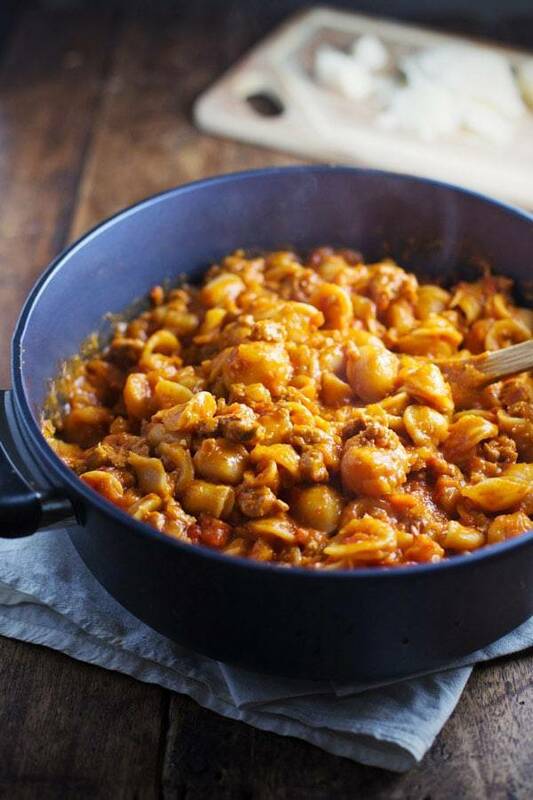 This yummy and simple San Marzano Pasta e Fagioli is so easy and FULL of flavor. A perfect delicious and comforting family dinner. 1 lb. chicken sausages in casing. GO SPICY if u dare. Remove the chicken from its casing. In a large pot, brown the chicken sausage over medium high heat and drain the excess grease. Set aside. Crush the San Marzano tomatoes and sauce in a food processor and set aside. Drain the cannellini beans. Place in a food processor. Refill the can with water, add to the food processor, and puree until very smooth. In the same large pot as step one, saute the mirepoix, garlic, oregano, salt, and bay leaf (with a little olive oil if needed) until soft and fragrant. Add the tomatoes, pureed beans, and broth. Simmer for 20 minutes. Saucy. Add the pasta and simmer for another 20 minutes until pasta is cooked through as sauce is reduced. Throw in the baby spinach and the chicken sausage from step one. 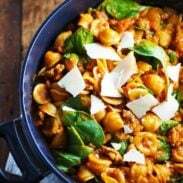 If needed, add water or broth to adjust the consistency of the pasta before serving. Top with cheese. Save some for lunch tomorrow. It makes awesome leftovers. *You don’t have to, but it really does save time to buy prechopped mirepoix (just carrots, celery, and onion). I bought some at Trader Joe’s in the produce section and it was super fresh and cut down on prep time and number of ingredients I needed to buy on a busy weeknight! Thumbs up to that. I made this tonight, and my only modification was to cut the recipe in half. It tasted exactly like a dish one could order at an Italian restaurant, and orchiette noodles from Trader Joe’s were great. Maybe my taste buds have been numbed by a cold and too much boiling hot ginger tea, but I felt that the sauce was a little bland for me. Next time I might spring for fresh oregano and some red pepper flakes to punch it up a notch. Judy–Not sure if you will see this, as I’m not directly replying to you, but sausage is made of ground meat and spices. It isn’t the same thing as plain raw meat. You take it out of the casing so that you can break it up into pieces. Thanks for the comment Katie! I know it’s sausage. And I know it’s seasoned but there’s no butchers here. The supermarket had plain old sausages. I’m seeing this by luck. yummmm! Glad you liked it! This looks delicious! And I love pasta made with shells and all the yummy goodness gets stuffed in the shell in each bite! YUM! I made this for the first time and it is AMAZING. My kids loved and and it is going to be a hit in our family for many years. Thanks for such a great site! Thank you Christina! This is one of my faves too! The soup looks so good… I love these recipe which are good enough for a complete meal. Going to make some real soon. I love hearing that! Thanks for the comment Krystle! It says to add the tomatoes and SAUCE into the food processor, but there is no sauce listed in your ingredients. Very confusing. Please help! Good question, Christina! Simply use the “sauce” or “juice” that is in the canned tomatoes. Basically, don’t drain the tomatoes. 🙂 Hope that helps! I made this last night and it was mind-blowing how delicious it was. My boyfriend was super impressed with me. Definitely one of the best Italian dishes I have made! Two side notes: It took me longer to get my pasta to cook for some reason (like double the time) but that’s fine. Also I didn’t quite know where to add the 28 oz of broth? I just dumped it in as needed. Again, though: this was SO GOOD! Thanks for the recipe. I love this site. So glad to hear that, Steff! Thanks for the comment! I substituted ground beef for the chicken sausage bc the husband is not a fan =( It was good, but I’m going to try it again with the sausage, sounds amazing! Hope it works out better with the sausage, Dana! San Marzano tomatoes ♥ one of the most appreciated product of our land! Live Salerno, LOVE SALERNO and EAT SALERNO.